We've added quads to our list! These great, made in USA cycles ship directly from the factory... at factory prices! All available with 1/2 horse-power, or full 1 HP electric assist! BOTH motors come installed with battery box, electronic throttle, and lockable ignition. 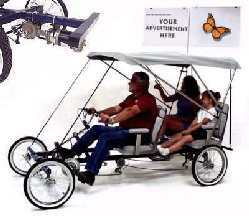 Both motors can be used with or without pedaling. The pedaling and the motoring are independent. 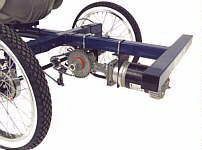 Both units are chain driven to the rear axle, and are freewheeling so they add no resistance when not being used. Both units provide power assistance up to 15 mph. Contact us for pricing on the pedi-cab quad (single driver type, above left). 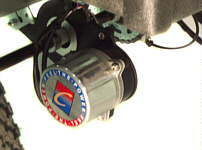 The PD-400 motor assist is a 24 vdc 400 watt motor. It's a lightweight 30lb system for those that want to primarily pedal, but also want to have a motor assist. It comes with 12ah batterys and charger. Range with intermittant motor usage is up to 10 miles with furnished battery, and up to 60 miles with larger locally available 85 ah batteries. The PD-750 motor assist is a 24 vdc 750 watt motor. 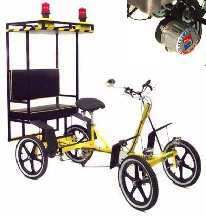 It's a heavy duty continous use system for those that may want to do more motoring than pedaling. This system weighs 30 lbs without batteries. It uses locally available deep cycle batteries. Range with intermittant motor usage is up to 30 miles with 35 ah batteries, and up to 60 miles with 85 ah batteries. The PD-750 is recommended for use on 4w2pcp and 4w4p, where the load requirement and usage will be heavy.